Riding across the border into Georgia I was immediately struck by the roads. They were a whole lot narrower than in Turkey and not in the best state of repair. That was OK though as it would transpire that Georgia has other things to make up for the roads. One of these is a thriving wine industry. I had been missing wine quite badly in Turkey as it is hard to come by and expensive when you do. In Georgia it is plentiful and pretty good quality. Well good quality if you want it to be – Rubina and I may have ordered a litre in a restaurant that cost about £2…it grew on us. 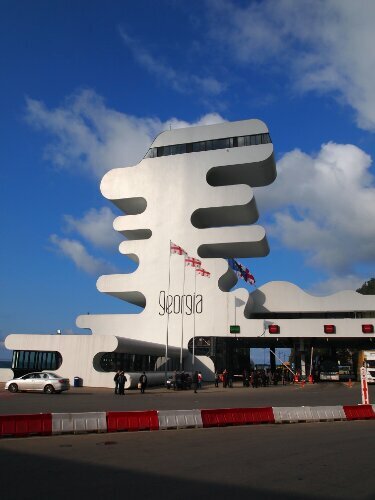 Our first stop in Georgia was to be Batumi, a place that had been described to us by Turkish people as ‘Sin City’ due to the casinos and fun times to be had there. I was thus not sure what to expect from our first Georgian city. Happily or perhaps unhappily it did not turn out to be the den of iniquity that had been described to us – or perhaps my idea of decadence is a bit further along than your average Turkish person. Most of the construction is apparently to kick off the previous Georgian president’s drive to turn Batumi into a world class tourist resort. Alongside the new buildings a lot of work has gone into the city’s old town, which has been very well restored. Batumi’s piazza is lovely. The whole place was quite empty while we were there as it was off season but luckily the weather was great with clear blue skies. 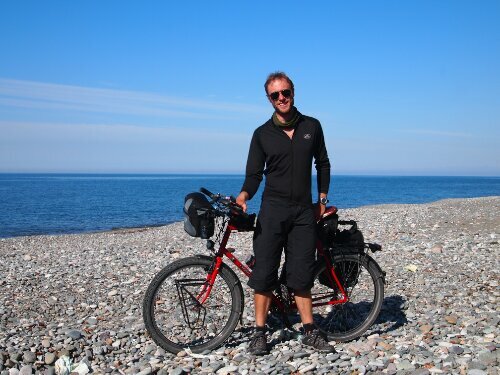 On one of the days we spent there we even cycled to a nearby beach and swam in the Black Sea. 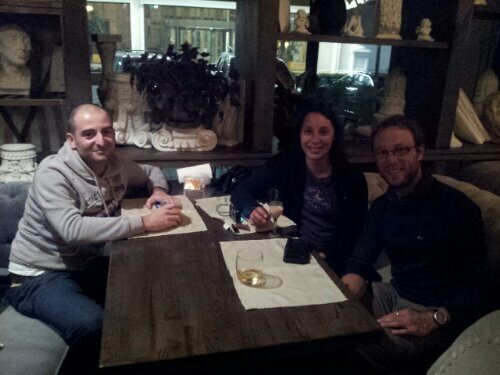 While in Batumi, we were lucky enough to be hosted by Irakli through the couchsurfing website. 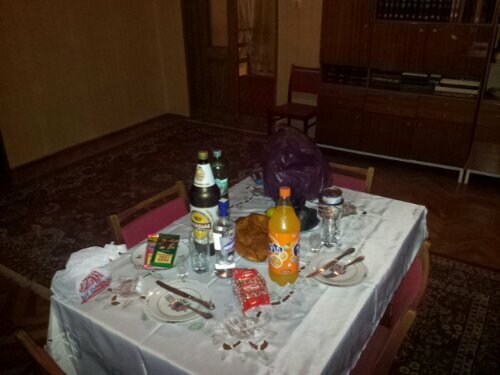 Irakli was kind enough to let us use the ground floor of his family house, when it wasn’t in use as a poker den. 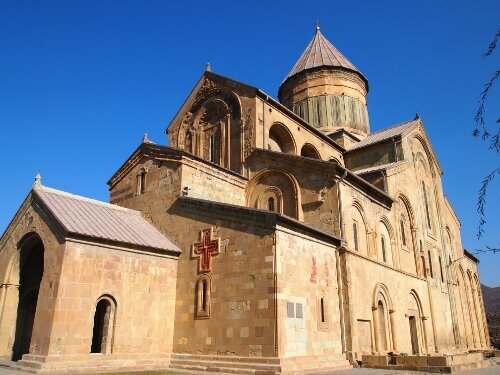 It was great to stay with a local and we were lucky enough to be taken to some real Georgian restaurants and to try the local cuisine. 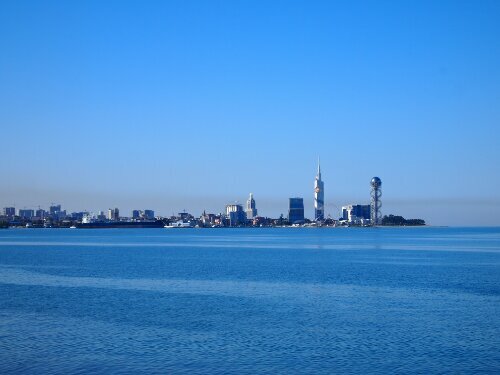 Batumi and the region it is capital of: Ajara are famous for Ajarian Kachapuri. This is basically a boat of flat bread with cheese inside topped off with butter and an egg. It is delicious but a heart attack waiting to happen. The other bits of Georgian cuisine that we saw the most of were Khinkali and lobio. The former are dumplings usually made with meat, potato or cheese and the latter a clay pot with beans in. I may also have eaten more than our fair share of ice cream and cakes on the basis of trying to fatten myself up for winter. Being in Batumi after Turkey felt very strange, a lot of the time it felt like being back in western Europe – with nice little cafes and attractive squares. There was no call to prayer either and the rhythm of life felt very different with shops seeming to open much later and alcohol available everywhere. 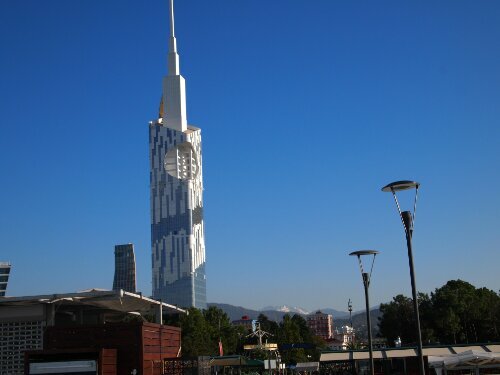 Batumi is also well known for its casinos and one night we decided to see what they were like. While both Rubina and I had been in Casinos neither of us had ever actually gambled at a proper one so we were keen to try. Irakli was kind enough to take us along to Casino Peace at the Sheraton where I hope we didn’t embarrass him too much with our amateurism. First off we established our credentials as high rollers by changing the minimum amount of cash into chips together as a joint venture. This meant we had the incredible sum of $60 between us. Looking at the games on offer we decided on roulette as being probably the easiest and so took our seats at an empty table, wisely it turns out. It took the croupier about five minutes and a voided spin to explain how we could place our bets. Which added up to us having to place $5 worth of bets on, split however we chose apart from on red or black to win which required a $25 bet. After having figured this out we then shocked the croupier by going on an incredible spree of luck. I think Rubina only had about two spins out of about thirty where she didn’t win something. I also managed to win on 0 twice and 23 once. The upshot was that we walked in with $60 and out with $110, heady stuff. Sadly the scale of our gambling meant we had only been comped juice and tea so we went to a nearby bar to enjoy some of our winnings. We spent four nights in Batumi in total, which is more than we had planned. This was because we had to wait for our Azeri visas. 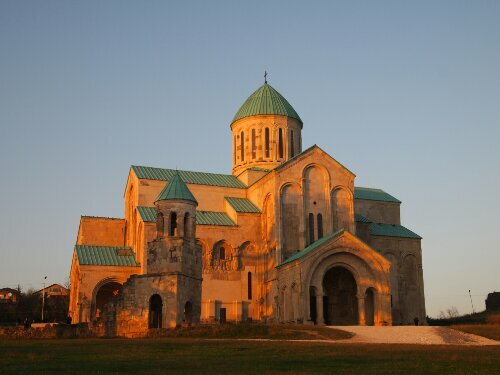 I had read on the excellent Caravanistan website that Batumi is the only Azeri consulate that doesn’t require an expensive Letter of Invitation to get a visa. This turned out to be true and apart from the wait getting the visa was very smooth. Finally the day came to collect our visas and we rolled round to the consulate. After 11am. The consul was a very nice guy who appeared to keep very nice hours. Once these were in hand we rode off into Georgia proper under more crisp clear blue skies. As mentioned riding in Georgia was very different from Turkey, though we were taking the main route to the capital, the Georgian equivalent of the M1, M6 and every other motorway you can think of in the UK rolled into one it was still only very seldom a proper highway. More usually it resembled a bad A road with barely any hard shoulder and only two lanes. The countryside made up for it by being exquisite. In quite a few places it resembled the UK and was a nice change from the unending, sere and minimalist beauty of a lot of Turkey. There was also more going on as the road would go straight through towns and villages whereas in Turkey these would be bypassed (great for speedy travel but boring for cyclists). We even stopped for lunch at the ruins of a fortress of some kind. That evening we had planned on camping as neither Rubina or I had done much for a while. 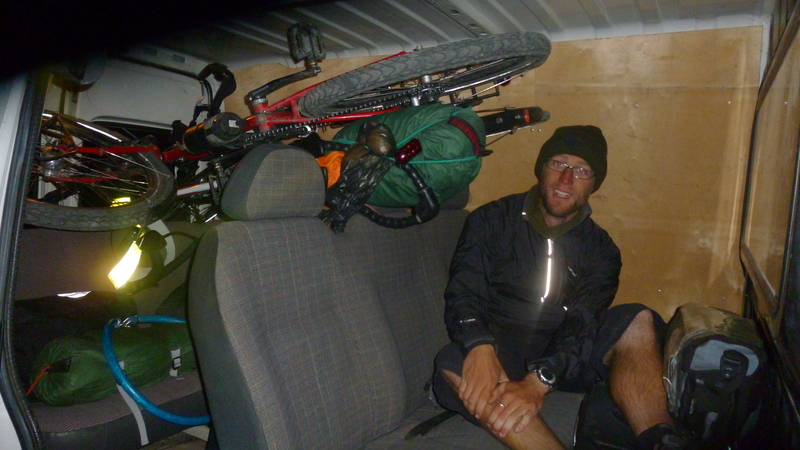 At the same time we were quite keen on meeting some locals so we wanted to see if we would be able to camp in someone’s garden or on their land. We thus picked a time at which to start searching and once this came round we started looking hopefully at the places we were passing at the side of the road. The area we had reached was like one long suburban street with big houses facing the road with what appeared to be large gardens in front. Most of the houses appeared to be made from concrete and corrugated iron so while they looked solid they definitely didn’t look as if they were mansions. A few minutes passed without seeing any likely places when as we rode passed I saw a couple of people working in front of their house about forty metres from the road. Rubina and I then decided to give them a try. Rubina was going to do the talking as I couldn’t even begin to imagine how I would go about asking someone if I could randomly camp in their front garden. Standing at their gate Ruby waved a a few times to no result but eventually they seemed to notice us but were very tentative about coming over. From a distance they appeared to be a middle aged couple and finally the man came over. This led to a mutually incomprehensible conversation in which Rubina basically tried to explain we were looking for somewhere to camp and well if they couldn’t think of anywhere how about their garden. Then their son appeared who seemed a lot keener to let a couple of foreigners on bicycles in. Next thing we knew we were inside the gates. To start with we had been going to camp, then the son gestured at a couch in what appeared to be their front room and so it seemed we would get to sleep inside. Whilst being under the stars is great it can be a pain having to deal with a damp tent in the morning and the whole packing up process can take a while, so a couch or the floor was a good result. Next we were sat down and a procession of fruit was brought for us to eat. This was all organic and grown by the family we had imposed on. It would turn out that they were farmers and behind the house and not visible from the road was their farm. We only saw the edge of it as there trees and bushes blocking our view – occasionally a cow or a horse would wander to the edge causing us to wonder how much livestock and land there was behind. There was also now a larger group of people as the son and father had been joined by a daughter and the neighbour’s son and daughter who all seemed pretty curious about us. As we munched on the fruit the father started indicating that we should have a drink and various alcoholic drinks were named. I just tried to look confused in the hope they wouldn’t bring any as I didn’t want to drink anything on a stomach filled only with fruit. Next thing the father is talking about something called chacha and he appears with an unmarked bottle of clear, green tinted liquid. He poured out a shot for himself, Rubina and me. On smelling it I wondered if we were supposed to drink it or use it to power my cooking stove – it was apparently 70 or 80%. Drink it we did though and it was like pouring fire down your throat. When asked the father had indicated we should sip…this was a lie or a misunderstanding! Sipping only prolongs the agony and I think I probably went cross eyed after the second sip. Thankfully I think they noticed that we were probably not enjoying the chacha so they switched to plying us with a much lighter Georgian brandy, which at 40% tasted like a fruit juice after the chacha. After a while of this Rubina asked to look around the farm and we strolled around the small yard at the back to get some photos. 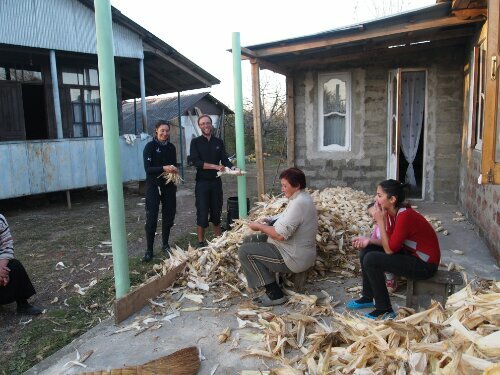 We then saw the mother shucking corn by the side of the house and asked to help, which threw them off a bit. As Rubina remarked we appeared to have started our own WWOOF. After about half an hour of this though they made us stop and eat more fruit, drink more brandy and generally attempt to cross the language barrier as much as possible. We were then invited in to another building which appeared to house the kitchen and day to day sitting and dining room. We never quite worked out how the buildings worked that they had. They appeared to have two main structures, one made of wood that they kept heated with wood burning stove where they cooked, ate and watched television and maybe some part of the family slept. The second was made of concrete and wasn’t finished at the back, this contained the sitting room they had put us in originally and it transpired at least one bedroom, from the road we had thought this would be the building where everything happened but apparently it was not. None of the buildings had running water or plumbing and the toilet was an outhouse at the back where you would not want to spend any more time than absolutely necessary. 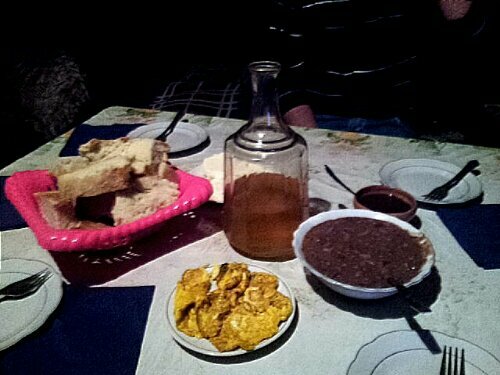 In the warm wooden building we were treated to a dinner made completely from the produce of their farm. This included cheese, bread and Georgian baked beans which was delicious. Come bed time we thought we were going to be in our sleeping bags on the floor but instead we were led to a room with two beds in and told we could sleep here. I’m still not sure if this was a guestroom or perhaps the parents bedroom, it was better than the floor though! The next day when we woke up we were brought in for a breakfast of more bread, beans and cheese, which was great. What was not great was that the father seemed to think we should drink some chacha with the food. I tried to say no but my pleas fell on deaf ears and next thing I know I had a shot in front of me and the clock not yet at 9am. Rubina somehow managed to avoid hers so it was just me and the father with our early morning pick me up and smash my head against the walls to drink. This time we didn’t sip though and the father and I just chucked them back, which was a lot less painful. Two more shots of it later and I was almost enjoying it…I’d probably numbed the back of my throat. The world certainly seemed a little brighter and as we set off I was feeling pretty cheerful. I think my coordination may have suffered somewhat as I clipped Ruby’s panniers with mine one time and I was certainly saying hello to more people than usual by the side of the road. 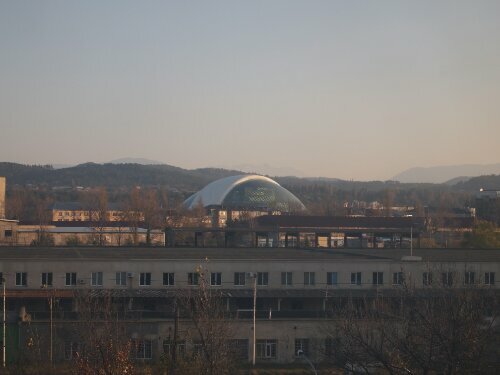 It is also the administrative capital of Georgia and has some pretty trippy futuristic buildings that look like space aliens have landed and are very incongruous amongst a lot of the soviet apartment blocks people live in. Indeed, we would be spending the night ourselves in one of these buildings courtesy of David a couchsurfing host who kindly let us stay in his and his friend’s ‘party flat’. The next day was my birthday and I was hopeful for an easy ride. I’d picked out what looked like a large town on the map we’d been given by the tourist information guys on our first day in the country. I thought we would reach it without much trouble as it was only 100km even though I knew there was about 800m of climb as well. For the first two hours it seemed that this would be impossible as we rode into an incredible headwind. Not the worst I have experienced but definitely the second! Rubina, who sails, said it must have been around 35kph and it certainly felt it. It was also pretty dusty which made it quite unpleasant. Luckily the wind did not stay at such a terrible pace for the whole day and it slackened off in parts and the sky was blue which is always cheering. I was even back in short sleeves for most of the day. Also the Georgian scenery was beautiful as we wound through a very long valley following a river, we barely noticed we had reached 500m of altitude it was so gradual. Then we hit the climb proper and had a fairly gruelling push up to 850m where we were presented with a choice. 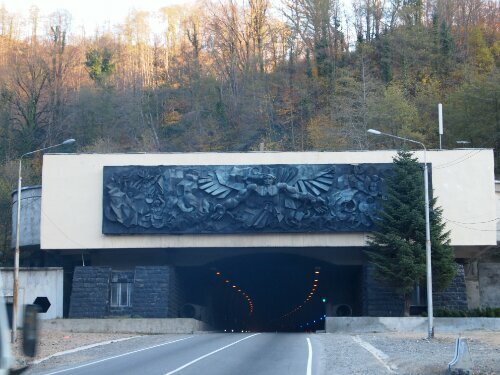 A tunnel with the scariest looking mouth I have seen – it looks like the angel of death beckoning you in, or a 4.5km bypass which would take us up to about 1400m. Rubina and I didn’t really need to discuss it, we headed into the tunnel! Which while being well lit was still pretty scary as it only had two lanes for both directions…we found some energy somewhere and pushed through quite quickly avoiding being knocked off by lorries quite narrowly sometimes! Thankfully we knew we had reached the end of the climb and that it would be an easy down into the town for the night. 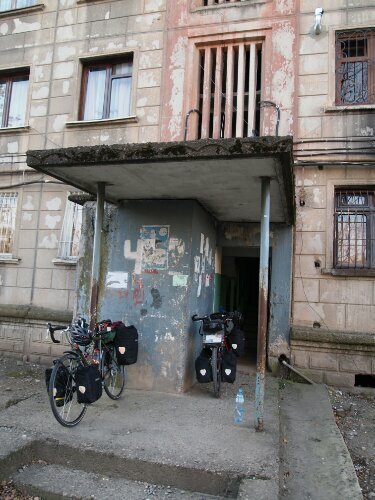 I was hoping to find a hotel to stay in for the night of my birthday – I had hadn’t had a hot shower since I left Turkey six days ago, and no shower at all since Batumi. As we rode down the hill into the town before the one in which we had planned on staying we saw a hotel. We carried on though, I thought if there was a hotel here on the edge of the town of this town which looked much smaller on the map there should be a few at our destination. So further down we went into Kashuri, notable for very little it turns out – except for not having any hotels. This we discovered from a Georgian English teacher who saw us looking a little lost in the centre of town. She told us that sadly there were no hotels here but there were in the town we had just come from: Surami. Which is not what we wanted to hear as darkness closed in after a very long tiring day. She could clearly see our dismay and went to work trying to help us. She managed to find a guesthouse for us to stay in and called her husband to come and collect us in his minibus and drive us back the way we had come up the hill to the place we would stay. We were pretty grateful for this having no desire to climb back the way we had come under our own steam. We just about managed to fit in the bus! As you can see here: BUS The husband of the lady was very friendly as well and possibly half cut – luckily he wasn’t driving. 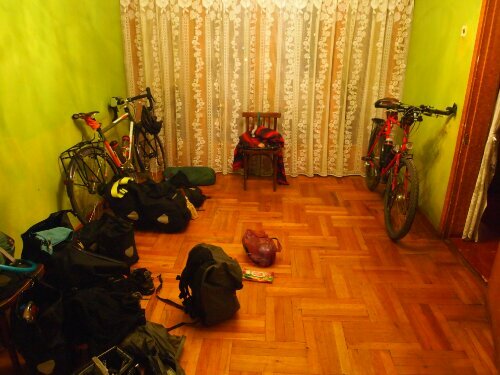 The guesthouse we were brought to was very nice and we had a large set of rooms to ourselves and comfortable beds. 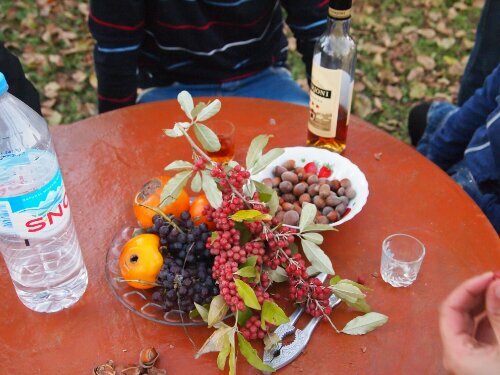 The son of the owners took us to a market and we were able to buy some drinks and snacks to make a small celebration. Sadly they didn’t have a working hot shower, or in fact a working shower. Washing involved a splash bath with water from a wood burning stove. At least I felt cleaner than for the past couple of days! The next day we headed off towards Gori, which has an incredible fortress on the hill and a reasonably priced hotel with warm showers, which cheered us no end. After Gori we made for Tbilisi, stopping at Mtskheta, the ancient capital of Georgia, which has some beautiful old buildings. And then finally we reached the actual capital.